Dexter Daily: C.S. Lee Dishes on Masuka's Latest Discovery: "It Is Going to Change Him"
C.S. Lee Dishes on Masuka's Latest Discovery: "It Is Going to Change Him"
via Examiner: "You definitely see a new side to him...I think definitely having a daughter is going to change him. How can it not? It's such a big life change," C.S. Lee said to LA TV Insider Examiner when we caught up with him at the Showtime "For Your Consideration" wrapped Coolhaus ice cream truck in Los Angeles. "The show is called Dexter; it's not called Masuka. I wish it was, but you know, Dexter is the cake, and we're sort of the icing on the cake, and you can only devote a certain amount of time [to this story], but we do get into the fun of how these two get to know each other." Read the rest after the jump, and beware of spoilers. With only a handful of episodes left, the show has to wrap up the saga of Dexter Morgan (Michael C. Hall) first and foremost. But instead of dedicating the final episodes solely to bringing the question of sociopath subtext to the surface and forefront of the story, the show is also expanding outward and keeping complications alive for the other characters as much as it can. In a way this should serve to tug at your heartstrings harder should Dexter have to sacrifice any others to save himself, but it can also serve to imagine the rich relationships and lives they may go on to have sans Dexter. 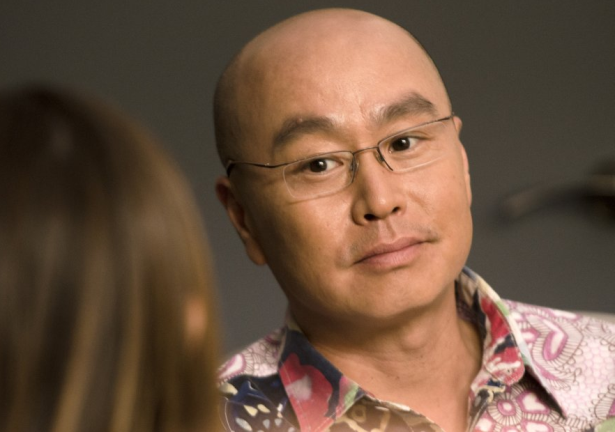 "We find out later that maybe, perhaps they're not similar, and some issues come up that may or may not be down Masuka's road, so he has to learn to deal with that," Lee said of he and his on-screen daughter, Dora Madison Burge. The show is taking time to show off similarities in the lives and trajectories of the characters on a subtextual level because Dexter Morgan himself and his situation are both extremely unique that ties and bonds need to be brought in through subtle areas. But additionally, the show has only a handful of episodes left to wrap up the story of Dexter Morgan and the people he has come to call his friends. "The fact that I have a [daughter] is sort of, I think, in line with the theme of what Dexter is going through. If you think about it, the whole familia thing is all in that same realm. It's not a random plot point. I think the writers made it that way because it's all sort of in line with where Dexter's character is going with Harrison." In a way, though, Masuka having to deal with having a daughter-- and a grown one at that-- could act as a distraction towards what has been going on under his nose with his companion in the lab for all of these years. Early on in this season, Masuka made a comment about always covering for Dexter in a way that made it sound like he could be collateral damage should Dexter be exposed. How likely it is that it actually happens, though depends on a number of key characters at this point in the story. Of course, there's the good Dr. Vogel (Charlotte Rampling) who has known and kept Dexter's secrets for all of these years, only to realize now that he may be deeper and more complex than she imagined when she crafted a code based on second-hand stories from a man with a sensitive conscience. "In a way, she's a big bomb waiting to go off, and that's something Dexter should be concerned about," Lee said. But more importantly, there are those who have been in Dexter's lives for years and may be unable to avoid that something is terribly wrong now that they see the shape Debra (Jennifer Carpenter) is in and just how badly she wants to hurt her own brother. "Any of us at Miami Metro could be a hurdle in there for Dexter. In a way I feel like that's what the fans want. That's the big elephant in the room. Debra knows; who else is going to find out and what are the implications of that? Is he going to get arrested? Is Quinn going to find out and get killed? What happens if Angel finds out; how can Dexter kill Angel; they're such good friends? How could he kill me? But if he had to, maybe he would," Lee said. If Lee has his way, though, Masuka won't actually be the one to find out about Dexter. Though he shared that he would love for the idea to kind of "cross his mind" and pursue a little amateur detective work of his own for a short bit (maybe even with his kid as his sidekick!? ), ultimately he wanted Masuka to give his buddy the benefit of the doubt and say "No, there's no way" Dexter could be a killer. "It would be nice to sort of half-cross that road but not end up in the grave!" Lee said.